Everybody needs something to believe in. They used to worship the sun. The sun is God. The artists wanted to create their own icon. 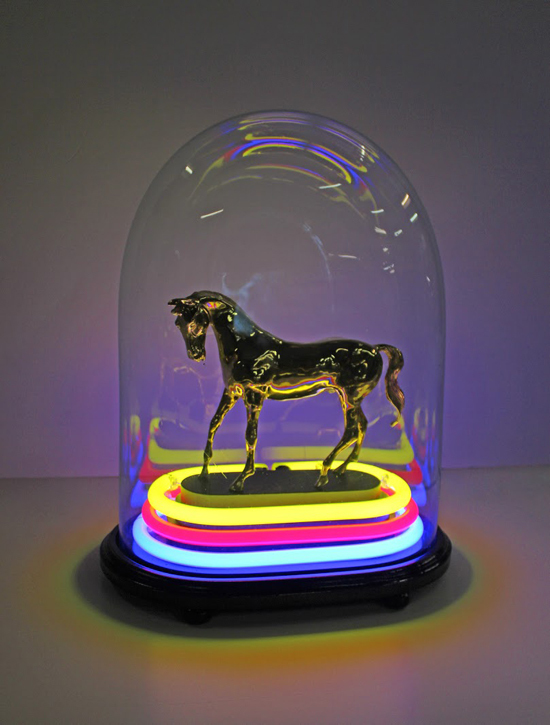 The clear glass dome helps capture the spirit of the pure neon light, in reflections and refractions. In Indian culture the cow is sacred. Here they make the horse sacred. The horse can symbolise personal drive, passion and appetite for freedom. In Feng Shui the horse brings the energy of success, fame, freedom and speed and fortune. Art is an impulse. Uncontrollable and necessary. Cultures need shamens and visionaries to lead the way. To reveal the future through their own visions. The artists have created a rare icon that symbolizes art itself. A Mayan temple – A solar deity to creativitiy.